Club Penguin Cheats by Mimo777 Club Penguin Cheats by Mimo777: Club Penguin Puffle Handler Arrives Tomorrow! Club Penguin's Happy77 said the team is still working on all the new puffle updates. They are taking a longer than they thought. But, they hope to have them by tomorrow! Saweet! It's Puffle Handler! Club Penguin thought she would be helpful to new puffle owners. We will see her tomorrow when we take care of our furry friends! Hmmm, what do you think we should call PH? The Club Penguin team has suggested names like Paige, Penny and Polly, but they want to know what you would like to name her? I'm thinking Poca Hontas! ;-) Yeah baby! Let me hear your wackiest names, too! I think she looks like a Paige because someone in my class at school looks like her and shes called Paige. Now they post it!!!! I've been waiting all day!! I starting to think. 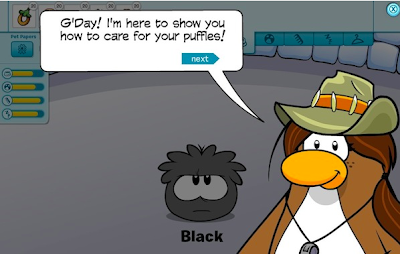 Is the Halloween catalog NOT out because CP is busy with the puffle updates? I've been waiting all day for the catalog! Why CP!? So have I! I wish they could have told us earlier! She looks like.. from Texas..
You get props for that Pocahontas name Mimo. yeah i have been waiting too! where the heck is the new catalogs?